Fifteen years ago today, I released my first full-scale original game: System's Twilight. And when I say "released", I mean "I uploaded it to the Info-Mac FTP archive at SUMEX-AIM." I set up a web page for the game, but I didn't publicize the URL much, because what was a URL? Everyone used FTP. many puzzles, some of which aren't obvious at all. I haven't pasted in the whole thing, but check it out for historic amusement. Bang paths! Compatible with System 6.0.7 and System 7! Trawling through the Usenet group for the era has been a blast. What were people talking about? Wolf3D. The Seventh Guest. Marathon. Myst, lots and lots of Myst. Doom (it will be ported to the Mac by Christmas! ...but only PPC Macs, not 68k.) And hey, there's a question about Zork (the mainframe Dungeon version, there, although there are also Return to Zork comments). And some lesser-remembered classics, or "classics". FA-18 Hornet. An RPG called Prince of Destruction (which I seem to have written a detailed review of, and then forgot the existence of). An overhyped Lode Runner remake. Oxyd. I see that nobody commented on System's Twilight for several weeks. That must have been frustrating. But some hint requests turned up in early November. the readme ([...]) still valid? The elided address was that of the shareware company that handled fulfilment from 1997 to 2000. So, no, it's not still valid -- please play my game for free! But I didn't ask where the querent had found version 1.0.5. Maybe one of those shareware-shovelware companies that used to orbit the Mac universe, Nemesis-like, raining down comets of questionable CD-ROMs. Conclusion: people still like my game! That's really cool. Answer: sure I've considered it. I haven't done it because it would be, probably, another year of work. The art is sized for a 320x512 pixel display; the code is built on the old Mac toolbox. Even the puzzle data files are formatted in Rez source code, for the Mac resource manager. So, basically, starting over. I've always had other projects that seemed more rewarding than re-releasing an old game. It's harder when somebody asks if they can port the game. For free, honest... but there's no such thing. I'd want the interface to be done right, which isn't necessarily the way I did it the first time. I'd want to test all the puzzle mechanics. I'd want, in short, to stick my finger in the soup all the time. Likely to be infuriating to the hapless volunteer -- and it would wind up eating months of my time anyway. So, for now, no ports. Don't come asking. The future may hold options. We'll see. System's Twilight is still one of my favorite puzzle experiences of all time (it would be tough to choose between it and Planetarium). Yay!! Happy birthday! Thunk! Zorp! Zip! Andrew, I adore this game -- I'd love to see it updated and ported to OSX. I first played it on an original iMac when I was about 13 (late for the game, but you got me when I was growing up) so I have a real nostalgic soft spot for it. I love the quirky graphics, story and sound effects almost as much as the puzzles. System's Twilight is what comes to mind whenever I hear the word "shareware". If you ever decide to work on a remake, please let me know! I'm happy to hear it holds fond memories for you. The status of the game hasn't changed in the past year, but if I ever do another version, I'll certainly post it here (and everywhere). Just wanted to thank you for System's Twilight. I've attempted going through the game twice and have never finished it. Ironically I got much further as a teenager in the nineties than as a university student. It's the best logic puzzle game I have ever played. Since I never finished, it has remained the itch in my mind that I can't scratch. Great work! The emulated machine (currently) has three System Folders with three different System versions: 6.0.8, 7.0.1, and 7.5.5. System's Twilight v1.1.0 works flawlessly under both 6.0.8 and 7.5.5, but crashes the entire virtual machine upon launch in System 7.0.1, with the bomb message reading "unimplemented trap". This is an absolutely stock System installation with NO third party extensions whatsoever. I know, I know... use 6.0.8 or 7.5.5. That's what I'm doing. :) Still, I'm curious why it would be so horribly incompatible with 7.0.1 yet NOT with the System versions on either side of it. The answer is probably just that I never tested it on 7.0.1. I was working on a Mac Centris, and I don't know what OS it shipped with but it might well have been 7.1. Given that, I would have written code for 7.1 with workarounds to call 6.0.7 functions if necessary. If I called something that didn't exist in 7.0, you'd see that error. It would be silly for me to request a bug fix at this stage in the program's life cycle, so I won't do that... but can you think of any way I might make it work in 7.0.1? An extension that implements the unimplemented trap, or something along those lines? Anything else I might try? I'm afraid I have no idea at all. You might be able to do enough debugging to figure out what call it is, but I still wouldn't know what to do about it. Fair enough. I can run it as it is; I just have to switch System folders first (since I usually use 7.0.1 on this particular VM). I'm afraid my Mac programming skills have long since atrophied, and they were never very good to begin with. I don't know where I'd find a copy of MPW these days anyway, even assuming it worked on a VM like Basilisk. I'm certainly not up to debugging anything any more! Again, thanks for putting the software out there! I'd love to see more puzzle games of that sort - I keep hoping Cliff Johnson will release his new "Fool's Errand" sequel, but it's still vaporware at this point. I also have come here just to tell you how much I appreciate your game when I was a child. I never did manage to complete it... I'm going to try my hand at this emulation thingy. I think there definitely would be a market for you on the App Store if you ever felt like it. I just finished playing through Yipe! V, another reminder of the good ol' days. Thank you so much for a brilliant game, Andrew! I adored - and still adore - this game. I have only pleasant memories of trying to work through this while I was younger - sometimes my dad would chime in, or do a puzzle here and there. Needless to say I didn't get very far back then! I came back to the game a few years ago, and finally sat down and worked through all of it. I remember a friend asking me then what my favourite game of the year was, and I could only say: "well... there's this puzzle game from 1994 I've been playing recently". In the original article, you said: "The iPhone? Ask me again in three years." It seems crazy, but almost three years have passed now, and I still haven't overcome the nagging that this game would sit beautifully on the iPhone, or iPad. In amongst the selfish feelings I have of wanting to play the game again (not emulated, I mean), I also can't help but remember those feelings of playing this game as a kid, overwhelmed but nonetheless determined to go on. In short, System's Twilight was one of only a handful of games that truly influenced my childhood. Maybe I'm just being overly nostalgic, or off in the clouds - but seeing an updated version of the game, accessible to the current generation growing up with games, well, I can't think of a better thing! And if it got to the point where I could find my own son struggling along with the game, and I could chime in, or do a puzzle here and there to help - wouldn't that be something! Nothing wrong with asking... the answer is "I'm still not planning a re-release." I would rather move forward to new projects. However, one possible new project is a puzzle game set in the SysTwi world. It wouldn't be as much of an adventure/exploration game, but it would appeal to fans, I think. I haven't even started this project -- it's just an outline right now -- but I will be considering it after Hadean Lands is settled and I am thinking about what to do next. ST is one of the brightest jewels making up the crown of classic Mac shareware games that everyone ought to play, if they can. I'm working on a game that's similarly centered on abstract characters of a sort, and I can only hope that it'll have the same poetic qualities that are ubiquitous in ST. I have many fond memories of tackling Systems Twilight with my wife back in the day. Neither one of us is what anybody would call a gamer, although Rachel did get hooked on classic Nethack for a while. Now that my kids are older and capable of trying these puzzles themselves (possibly more capable than I am), I'm going to try and install Executor on my Linux box and play with them. I can hardly wait. Thanks for all the work you did to provide so much pleasure to so many of us. Oh hey, this game turned 20 earlier this month. This game is one of the biggest reasons I keep my old Mac around. It's been a few years, but I assume still no plans for a port? I've been all busy with my new text adventure ( http://hadeanlands.com/ !) so I haven't had time to think about any other iOS projects. I still would rather write a new related game than port the old game. But it's going to be a lot of work either way. Thanks for checking in, though! Dear Andrew— I thought of System's Twilight yesterday and had to snoop around for info about it. I also loved that game and still kinda yearn for it. I'm wicked glad to have an old pizza-box 68k Mac Quadra I can play this game on. It engendered a great deal of affection. Good to know about Hadean Lands! I'll be seeing you in the realm of Text. All the best, Deirdre B.
Hi there! I missed this game back in the day, but a buddy of mine is streaming it on Twitch at the moment. Thought you might want to see. 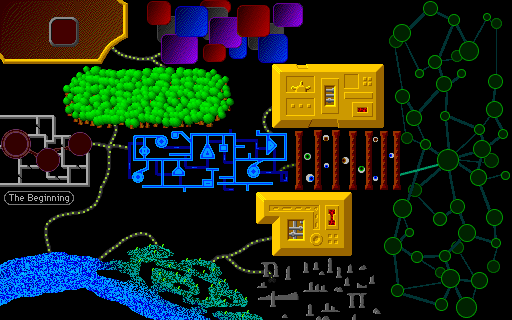 It's cool to see such creativity in the design with all the different sorts of puzzles from a time before genres were so rigidly defined. The word puzzles are especially neat. Thanks for keeping it alive here. Thanks for mentioning that. I don't regularly spend time on Twitch, but I'll take a look.